Calm waters you find e g in Dalsland and its many rift lakes, bounded by large steep cliffs along the fault margins. – The lakes are very protected from wind and therefore excellent for canoeing, if you want a safe ride. Paddling on for example Lelången is like paddling on a Norwegian fjord, says Crister Blüme, who organizes the yearly competition Dalsland’s Canoe Marathon and is an experienced local paddler. There are plenty of operators that rent canoes and kayaks and around hundred camping areas in north Dalsland and Värmland, often with BBQ-areas, windshields, outhouses, pre-cut firewood and trashbins. The stretch from Ljöradalen in Norway to Sälen in Dalarna has got a bit of everything for beginners and semi-qualified paddlers. ”You can have some action along the border, with streams and and rapids keeping you on your toes, or just choose to gently drift down the river from Fulunäset,” says Peter Löfstedt at Stöten Camping, that rent canoes and kayaks. The longest trip is almost 50 km and will take you from the Norwegian Ljöra, that changes name to Görälven on the Swedish side of the border, all the way down to Sälen. On this trip you spend two nights camping, first at the border, then in the nature reserve Hälla. The shortest version is a slow one hour trip down Görälven between Stöten camping and the Kungsleden trail. Another great region to paddle with kids is Småland, popular also for its other family attractions like Astrid Lindgrens Värld. Getnö is one of the great spots – right on the edge of the national park of Åsnen, Sweden’s 30th national park. Getnö provides a rustic resort where all visitors are very close to nature. You can also rent a kayak or canoe and paddle in the middle of the capital Stockholm! At Sjöcaféet by the Djurgården bridge you can rent a kayak by the hour, if you wish. Whatever destination you choose there are some general rules and tips to follow: always wear a life jacket and always make sure there are people ashore that knows where you are going. Sit down in the vessel. If you have a small kid sitting in the front of a kayak you might need to put some more weight in the front storage compartment, to stabilize the bow. Grown-ups might love to spend a day in a kayak, but kids needs to have a break every now and then. If your children are 3-4 years old you might consider to rent a canoe or a kayak with a large cockpit in the middle, so they can move a little. ”The length of the trips are depending on your kids age and patience,” says Christina Ingmarsdotter, who guides and organizes paddling courses in Grundsund in the middle of the Bohuslän coast. 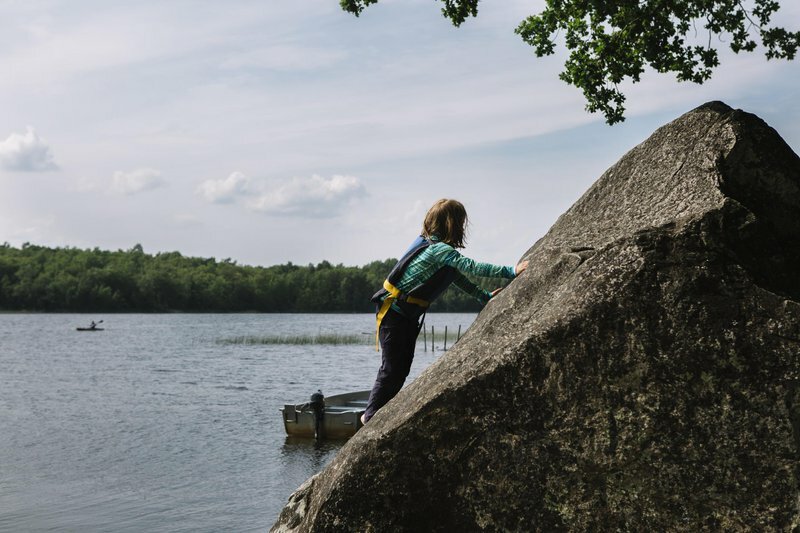 ”You also need to take breaks so the young paddlers can run around or maybe climb a rock.” She also recommends to camp at least one night along the way. "Kids love camping, but it’s also a good idea to put up your tent in one spot and then return there for the next night, to avoid too much time putting up and taking down the camp. Just remember to ask for permission if you camp in the same spot more than one night." Christina Ingmarsdotter’s own favorite trip is a trip around the island Skaftö, a 3-4 day trip with kids, 1-3 with grownups. "It has mixed Bohuslän scenery, from leafy to barren, and many spots to camp. Bassholmen’s wooden boat museum attracts all ages, there’s restaurants right down by the waterfront and endless possibilities for swimming."